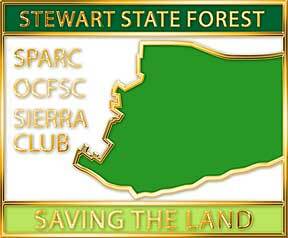 The Orange County Federation of Sportsmen's Clubs has sponsored the creation of a commemorative lapel pin celebrating the collaboration of SPARC, OCFSC and the Sierra Club as plaintiffs in the long-standing legal fight to secure the Stewart Buffer Lands as part of the Stewart State Forest. This pin itself is an example of collaboration between the organizations. Started with a concept by OCFSC President Carmen Heitczman, designed by SPARC Vice President and graphics professional Bo G. Eriksson, and tweaked by all three co-plaintiffs, this handsome little cloisonne lapel pin embodies the hope, cooperation and strengths of the three organizations in their determination to save the lands. • Standard 'military' style attaching mechanism. This pin is being offered for a $10 donation. All proceeds are applied to the Legal Fund. To obtain one or more, please contact the Federation at 845 782-7449, or SPARC at 845 564-3018. The pin will be available at all meetings and events of these organizations. Thank you. Click on the Buy Now button above to order the pin, with shipping to your home, right now! . Payments can be made with any major credit card or PayPal. A $0.75 shipping & handling charge will be added for each pin so, that the full $10 amount can be applied to the Legal Fund. Payments and shipping will go through edgeBlur, Inc. a company fully owned an operated by SPARC Vice President Bo G. Eriksson. Click here for more information about edgeBlur. No information will ever be sold or used for any other purposes then here stated.